Davidson Cares Kicks off First Annual Cooler & Cocktail Raffle! 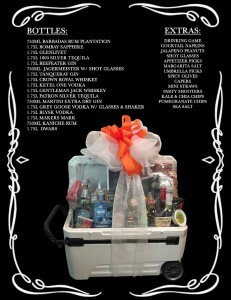 Davidson Cares is excited to share the news about their First Annual Cooler & Cocktail Raffle! The raffle prize, valued over $800, is an Igloo Glide 110-qt. marine wheeled cooler stocked with 17 bottles of premium assorted liquors, glasses, snacks and everything else you would need for a party on wheels! Davidson Realty President Sherry Davidson is thrilled to join the St. Johns County Education Foundation (SJCEF) Board of Directors! She plans to use her skills in accounting and taxation to serve on the SJCEF Finance Committee. Sherry has always been very passionate about education and SJCEF offers some great programs for our neighborhood schools! 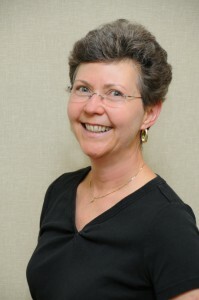 Sherry is President of Davidson Cares, Davidson Realty’s non-profit corporate giving program, which launched in 2011 to provide support for local St. Johns County schools through grants and fundraisers. Those schools include Wards Creek Elementary, Mill Creek Elementary, Palencia Elementary, Pacetti Bay Middle School and Nease High School. 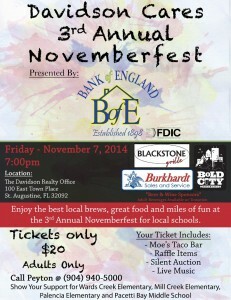 Over $5,000 Raised for the St Johns County Schools at Davidson Cares’ Novemberfest Fundraiser! Thank you so much to all of our World Golf Village neighbors, parents and friends for helping to raise over $5,000 for our schools at this year’s Davidson Cares’ Novemberfest Fundraiser! This year’s event was better than ever with live music by Terribly Fantastic, an incredible taco bar, delicious craft beers, delectable wines, and over 45 raffle/silent auction items. All money raised will be donated to Mill Creek Elementary, Wards Creek Elementary, Palencia Elementary, Pacetti Bay Middle School and Nease High School. 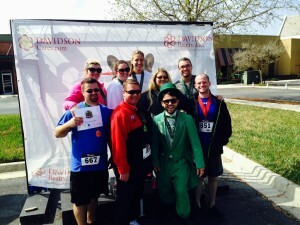 The 3rd Annual Davidson Cares Novemberfest is Coming to World Golf Village Nov. 7! 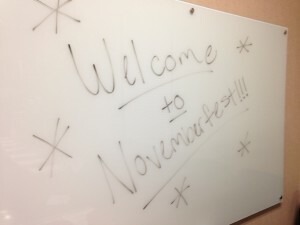 Davidson Realty is thrilled announce that Novemberfest, the annual fundraiser to benefit local schools through non-profit foundation Davidson Cares, is coming home to the Davidson offices on Friday, Nov. 7! Davidson Realty’s office building is located at 100 East Town Place in World Golf Village. This 3rd annual celebration will truly be an event to remember. Patrons will enjoy refreshing craft beers from Bold City Brewery, delectable wines by Blackstone Grille, and Moe’s Southwestern Grill’s fantastic taco bar. Not to mention the live music and silent auction/raffle items! Tickets are $20 ($15 goes straight to the schools) and all proceeds from the raffle and silent auction items go directly to the schools! Davidson Cares’ First Annual MOJO BBQ Night at Wards Creek Elementary! Davidson Cares and MOJO Old City BBQ are hosting their First Annual MOJO BBQ Night at Wards Creek Elementary School on Tuesday, October 7th! We’re making it easy for busy families and World Golf Village neighbors to enjoy a delicious barbeque meal and support Wards Creek at the same time! 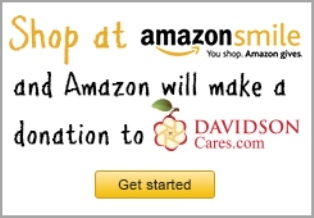 Three New Simple and Convenient Ways to Support our Schools! St. Augustine is known for great food and their food trucks are no exception. Every Tuesday, St. Augustine’s best food truck parks in front of Davidson Realty’s office building at the entrance to World Golf Village and serves amazing lunch items from 11 am to 2 pm. 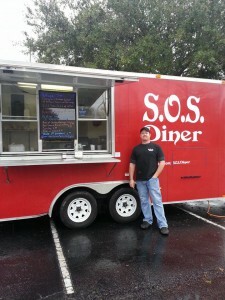 SOS Diner offers a wide variety of scrumptious choices on their normal menu, plus they always have weekly specials! SOS donates a percentage of proceeds every week to our local schools. Come by and sit in Davidson’s courtyard and enjoy your lunch or call your order in to-go at (904) 495-3792. To see their menu, visit www.facebook.com/davidsonrealty.